A group of Swazi nationals gathered outside the High Court in Pretoria on Wednesday morning hoping to get legal advice from one of the lawyers working on Oscar Pistorius's murder case. They were hoping to resolve a land dispute case involving their chief, prince MC Dlamini, who is a relative of Swaziland's King Mswati, and another man, said an induna who was part of the group and did not want to be named. "This man is living on the prince's land and they want him to go," said the induna. 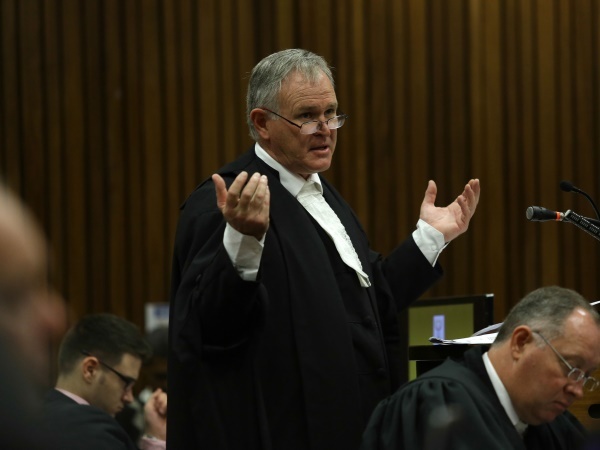 The induna did not know the name of the lawyer they wanted to see, but he said it was not Barry Roux, Pistorius's lawyer. "They have been sent by the prince to come and listen how do they talk this case," the man said. The group consisted of about 30 people, from Carolina in Mpumalanga, and mainly women. They had orange and white wraps with black and white images of Mswati printed on them draped over their shoulders, carried knobkerries and sang. "They are asking who is fighting for the land," the man said when asked what they were singing about. When asked why there were more women there, he laughed and said: "Because they are braver then men and when they want a thing they get it."